It was only a matter of time before Democratic rising star Andrew Gillum and former President Barack Obama‘s path’s crossed. 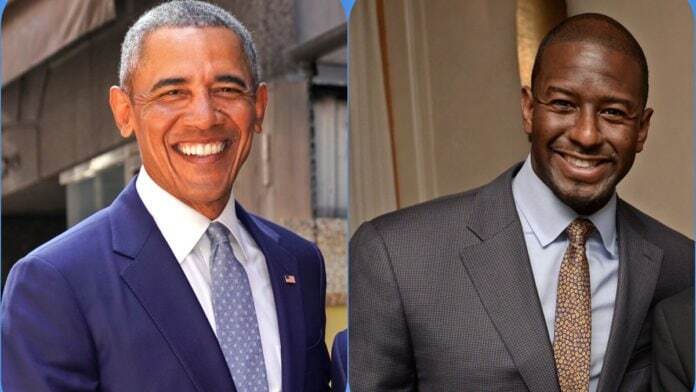 Monday, it was announced that Obama is scheduled to stump with Florida’s two top-of-ticket candidates, Gillum and U.S. Sen. Bill Nelson, in Miami on Friday, which is only four days before the November 6th elections. Florida’s gubernatorial race has increasingly received national attention, especially after Gillum’s impressive showing against DeSantis during last week’s debates. Gillum, who currently serves as the mayor of Tallahassee, has often been compared to Obama, and like the former president is running a campaign that relies heavily on the audacity of hope. If he wins, he would make history as Florida’s first black governor and last Wednesday, he called out his opponent, GOP nominee Ron DeSantis for fraternizing with racists intent to treat the color of his skin like a liability. “First of all, he’s got neo-Nazis helping him out in this state,” Gillum pointed out, referring to a white supremacist group that is running racist robo-calls against him. “Now, I’m not calling Mr. DeSantis a racist, I’m simply saying the racists believe he’s a racist,” he declared to raucous applause from the debate audience in attendance. READ MORE: Is Andrew Gillum the ‘Woke Obama’ we’ve all been waiting for? “I’m proud and humbled to have President Obama, my friend and a true patriot, on the campaign trail here in Florida,” Gillum said in a statement about this week’s visit.